Definition at line 610 of file RDFGraph.h. Definition at line 533 of file RDFGraph.cpp. 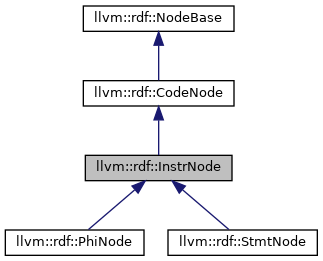 References llvm::rdf::NodeAddr< T >::Addr, llvm::rdf::DataFlowGraph::addr(), assert(), llvm::rdf::NodeAttrs::Block, llvm::rdf::NodeAttrs::Code, llvm::rdf::NodeBase::getKind(), llvm::rdf::NodeBase::getNext(), llvm::rdf::NodeBase::getType(), and llvm_unreachable. Referenced by llvm::rdf::DeadCodeElimination::erase(), llvm::rdf::Liveness::getNearestAliasedRef(), llvm::rdf::Liveness::resetKills(), and llvm::rdf::CopyPropagation::run().